Grandma’s Chicken made me like poultry. Juicy chicken encased in a cheesy, crunchy crust hooks you on the first bite, and leaves you wanting more. When I moved into my first apartment Junior year of college, I called my Grandma in a panic. Hungry and clueless, I begged her for some basic knowledge, and perhaps a simple recipe or two to help feed myself. 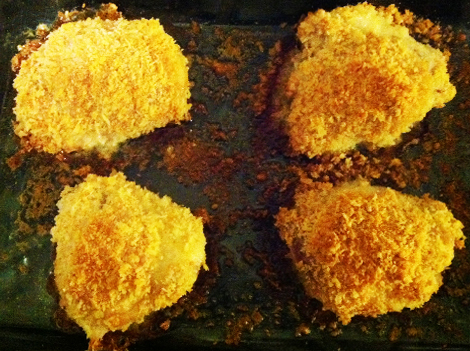 Make my parmesan chicken! She quipped. Chicken. You can use any part of the chicken, but it turns out the juiciest when you cook it with the skin and bones. I like thighs; dark meat is succulent. 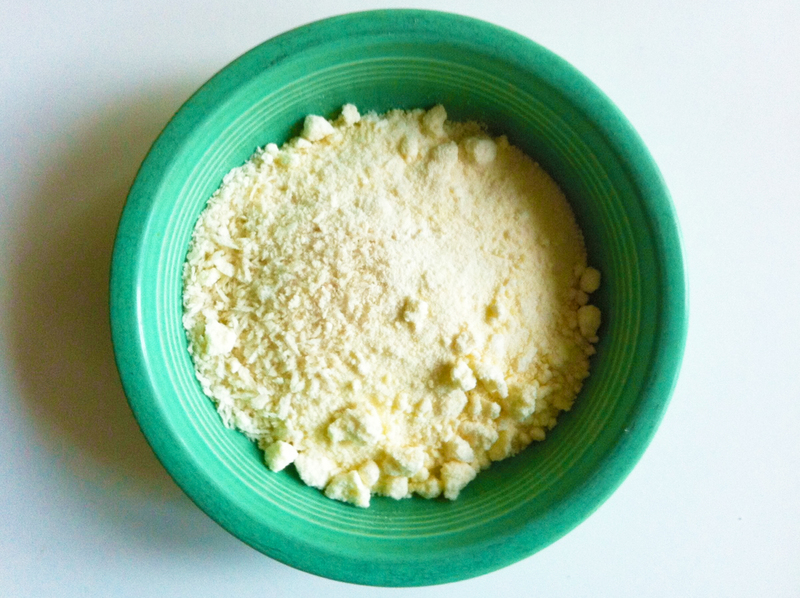 Cheap, grated parmesan cheese. Like the Kraft kind that comes in a green container. 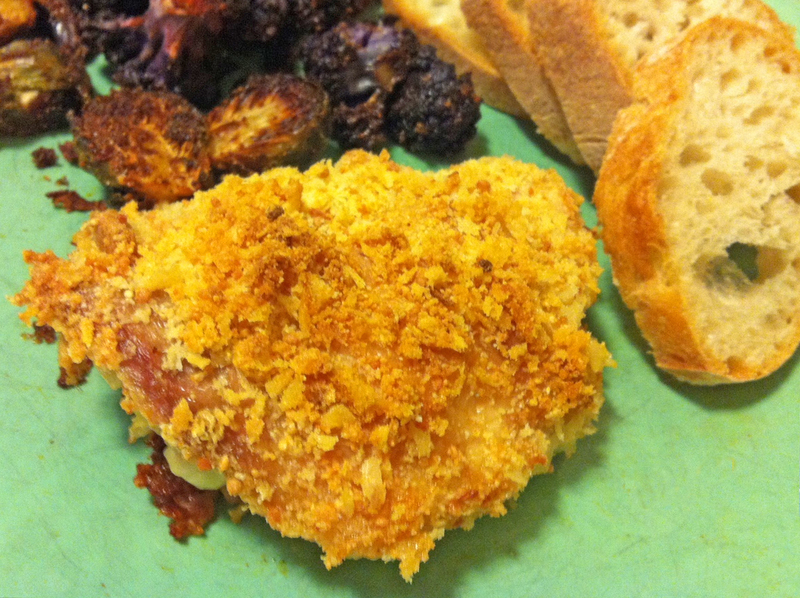 First, mix equal parts Panko and parmesan in a dish. Rinse your chicken thigh (or breast, or wing, etc). in cold water. 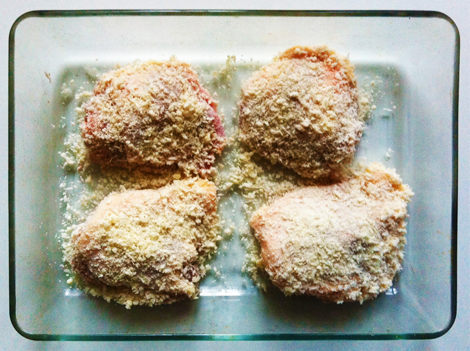 While still wet, thoroughly coat both sides of your bird in the breadcrumb/cheese mixture, and place it in a Pyrex cooking dish. No need to coat the Pyrex with oil. Cook the chicken at 350 degrees Fahrenheit until the chicken starts to brown – an hour or more. When your chicken is ready, be diligent with the spatula when taking it off the pan. The crispy, cheesy bits under the chicken are for suuure the best part. …and that’s it. It’s that simple! It doesn’t look fancy, and it might not be the prettiest meat you see on the web today, but you can bet your bottom dollar it’s the tastiest. Sounds like a yummy dish. Thanks for the pics. They are helpful!